If you’ve got kids who are involved in after school activities, this blog post is for you. If you’re a Stay-At-Home-Parent, you’re trying to coordinate everything and make sure the kids are where they need to be. And you want them getting picked up and dropped off on time. If you’re a working parent, you’re trying to coordinate all of this with your child care provider. To try and tame the chaos, I color coded my son’s activities in red and my daughter’s in blue. I told my sitter, “Let’s just plan to text each other a lot to get through this first week on this crazy schedule.” On Wednesday, I had the pick up time for Play Rehearsals wrong. And my sitter was having a really hard time understanding all of this when looking at it on her iPhone. Looking at the calendar, I had everything crammed into ONE calendar. I had more details than were really needed. Too many things were overlapping each other. I needed to simplify the calendar. 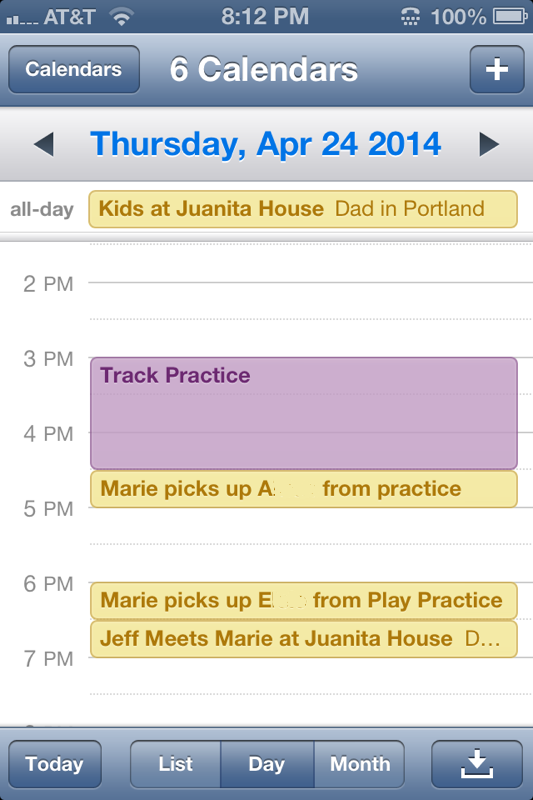 My babysitter needed to understand when to pick the kids up and where. 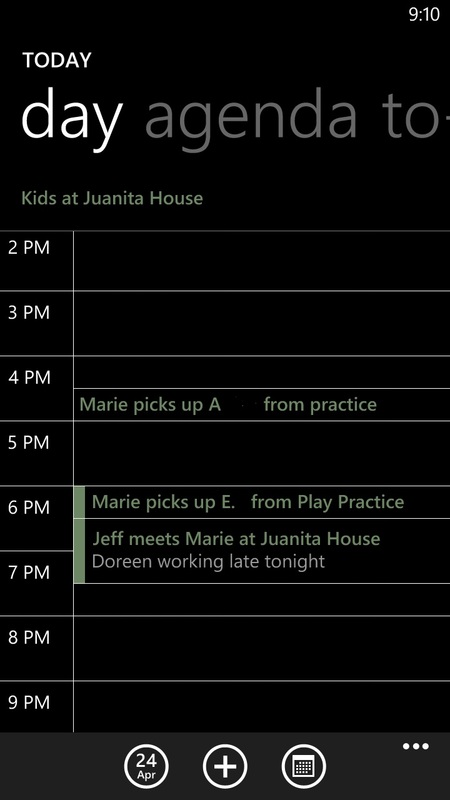 My son needed to understand his own schedule, know when he was getting picked up, and not have his sister’s activities cluttering up what he was looking at. He needed to see what HE cares about. I’m hoping that the schedule will be more clear. Everyone will be happier. And I won’t be distracted with lots of text message from a frustrated babysitter who can’t figure out where I need her to be because I haven’t set her up for success. Yes, we’re using multiple calendars and sharing them. It may sound complicated at first but once it’s set up, you’ll wonder how you ever functioned any other way. For those of you interested in some of the nitty-gritty details, keep reading. For the rest of you, happy scheduling! What is “Juanita House”? We are in a split family. Since the kids have 2 homes, “home” isn’t clear. I call my house “The Juanita House” so they know where they need to be. I don’t want to call it “Mom’s House” or “Mom and Jeff’s House” because it is “Our House”. Dad didn’t name his house (because he’s functioning like a normal person 😉 ) so we just call his house “Dad’s House”. Who are all of these people? Dad is Dad. Jeff is my husband. Marie is the afternoon babysitter. Lauren is my son’s ABA therapist (Autism services aide). 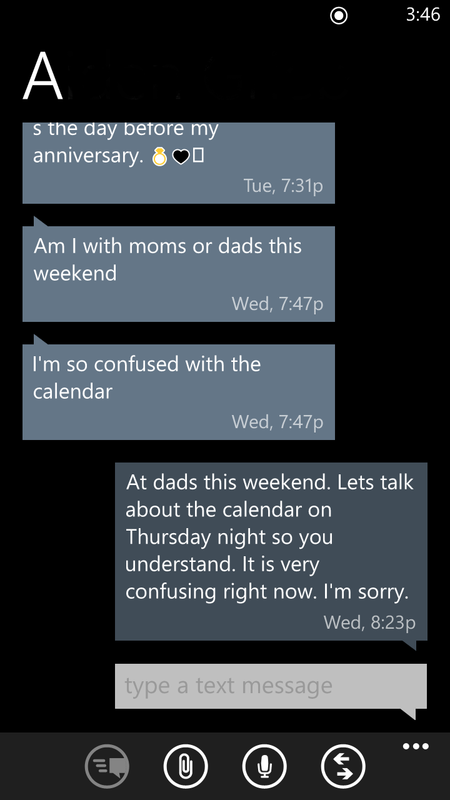 When I set up appointments with Lauren, I actually email those to her so they are on her calendar. Dad also has the appointments for “which house” on his calendar as well as anything that is on the days when the kids are with him at the end of the day. There’s a lot going on here but this way, everyone has what they need on THEIR calendar. Please send me your follow up questions! I’d be happy to do a dedicated blog post to deep dive on any questions you have. Posted in Time Management.Tagged Calendar, family calendar, Outlook, time management, work life balance, working mom, working parents.